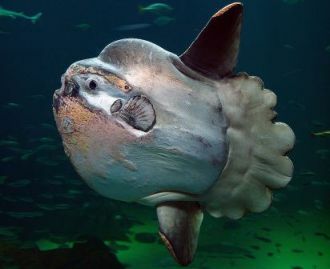 The ocean sunfish is famous for being the largest bony fish in the world. Its scientific name is the mola mola and it is often called the mola fish. 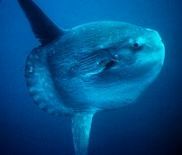 How big is the ocean sunfish? The average weight of the ocean sunfish is 2,200 pounds. However, some have reached a size as large as 5,000 pounds. They are a relatively flat and round shaped fish which can grow to 10 feet in length and 14 feet up and down across the fins. It has fairly small fins on its sides (pectoral fins), but large fins on the top and bottom. They are slow and ponderous swimmers, but they can swim. The sunfish has gray, rough skin which can get infested with lots of parasites. They use other fish and even birds to help eat the parasites and clean them from their skin. Ocean sunfish live in warmer ocean waters throughout the world. They often swim in open waters, but will sometimes come to the surface, lying on their sides to bask in the sun. This is probably to warm up so they can dive deep into the ocean again. Females can lay up to 300 eggs at a time. When the babies hatch they are called fry. A fry has sharp spines to help protect it that disappear once it grows to full size. The fry school in groups, probably for protection, but adults are more solitary. The ocean sunfish likes to eat jellyfish, but they will also eat other small fish, zooplankton, squid, small crustaceans and algae. They need to eat a lot of food to get so big, which is strange because they have a relatively small mouth for their size. They have fixed teeth in their mouth that they can use to break up harder food. The name mola comes from the Latin word meaning millstone. The fish can resemble a millstone with its round shape, rough skin, and gray color. Because of their massive size, they can cause serious damage to boats that run into them in the ocean. The main predators for adults are sharks, killer whales, and sea lions. Despite their huge size, they can leap out of the water and, on rare occasions, have leapt into boats. Humans do eat them for food and they are considered a delicacy in some areas of the world. Sunfish are kept in captivity, but their size makes it somewhat difficult. The only aquarium with an ocean sunfish exhibit in the United States when this article was written was the Monterey Bay Aquarium in California. Because of their large dorsal fins they are sometimes mistaken for sharks when they swim near the surface.